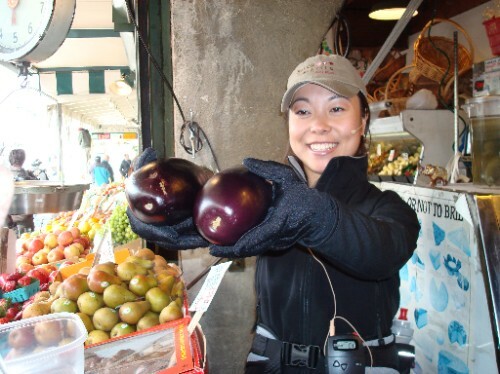 Climbed on the bus and headed downtown to Pike Place Market for my Food & Drink Tasting Tour www.savourseattletours.com. The meeting point was at Seattle's Best coffee shop on the corner of Pike Place & 1st Avenue. We were greeted by our hostess Angela. She gave us an overview and a bit of history about the market. There were 7 of us on the tour with her, and I won the prize from coming the furtherest!!! The rest were all Americans I think the 2nd furtherest was from Atlanta. So, being at Seattle's Best, another coffee outlet in Seattle that incidently was bought out by Starbucks, and is found on every other street corner in Seattle where there isn't a Starbucks!!!! Litterally!!! So, a quick shot of the day's speciallity espresso and tastletts of blueberry muffins ~ very nice!!! Our first 'shoppe' was Daily Dozen Doughnuts' ~ seriously, these are the best doghnuts money can buy. At this little cart, you can watch your mini-doghnuts get fried to crispy perfection. Served to you in a brown paper bag, these babies are best eaten when they are still hot.... andif the oil staining the brown paper bag hasn't grorssed you out yet. If you're bothered by that, then doghnuts probably aren't your thing anyway!! Next we headed to 'MarketSpice' ~ Established in 1911, and offers over 2000 different kinds of spices, teas & coffees.... We could smell the store before we even got there ~ incredible assult on the nasal passages!!! 'Pike Place Fish' ~ www.pikeplacefish.com The genuine fish market!! These guys love entertaining the crowds with their hootin', hollerin' & fish throwin'!!! When someone places an order, the fish monger standing in front of the store, calls it out to his colleagues on the raised platform behind the counter, and flings it over his head, where they catch it and holler back to him to confirm the order, then the whole lot of them shout out the order all together and cheer!!! It really was quite entertaining!! We sampled their smoked salmon!!! My mom would have loved this store!!! The best smoked Salmon I have ever tasted in my life!!! Another foreign delacacy I tried was Indian Candy, which is smoked salmon, which is dried, and then drenched in maple syryp ~ the thought of it didn't appeal to me, but it really is quite delicious, and a very healthy alternative to "candy"
Next we moved on to one of the many fresh produce stores. Frank's Quality Produce. www.franksproduce.com Take a look at the photos of these fresh produce shelves ~ I saw some fruit & veg I didn't even know what it was! Here we sampled some pears ~ delicious, and just ripe for the season!!! We also learned a little about the biology of Aubregines!! Yes, there are male & female Aubregines ~ the males have a round dimple at their base, and the females have an oblong dimple. Why do you ask do you need to know this bit of trivia ~ well, next time you are shopping for an Aubregine, pick up a male - they are the tastier!!!! The Confectional www.theconfectional.com We sampled white chocolate raspberry cheescake (words cannot describe), and a shot of their uber delicious Colombian hot chocolate YUMMMMMMYYYYY!!! Beecher's Handmade Cheese ~ www.beecherscheese.com We sampled their favourite, Flagship Reserve cheese - a robust & nutty flavour with a dry firm texture. We also sampled their mac & cheese ~ hmmmm very delicious, and served hot and fresh!! Piroshky-Piroshky ~ www.piroshkybakery.com You simply can't walk by within a half block radius of Piroshky-Piroshky without being overtaken by the tempting smell of these fresh, Russian Piroshky pastries. Kind of like a Cornish Pastie, but way better, the pastrie is so light, unlike the Cornish Pastie, and the array of fillings is astounding ~ favourite amongst our group was Salmon Pate filling!! Etta's Seafood ~ www.tomdouglas.com Famous Seattle Chef, Tom Douglas, has 5 signature restaurant, one of them being Ettas Seafood. Here we sampled his signature Triple Coconut Cream Pie ~ a light coconut pastry with a coconut cream filling and topped with shavings of fresh coconut ~ sounds rich, but it was very light and airy, and very delicious!!! Tasting Room / Wines of Washington ~ www.winesofwashington.com a great little wine cellar with a real "at home in your own cellar' kinda feel!! I was in my element, as the owner had 2 Golden Retriever dogs who lay at my feet under the table during our entire wine tasting!!! This is where our tour ended, and by this time, we had all become great friends. Angela was a fantastic host, and had some awesome stories and anecdotes she entertained us with ~ I would highly recommend this tour to anyone who visits Seattle ~ really worth it. After "lunch", I headed back to Pioneer Square where I joined Bill Speidel's Underground Tour. Hmmm, known as Seattle's most unusual attraction, this was a humorous guided tour through subterranean storefronts and sidewalks, entombed when the city was rebuilt ontop of itself after the Great Fire of 1889. The tour begins above ground in Doc Maynard's Public House, a restored 1890's saloon, straight out of a Western movie, then spills out onto historic Pioneer Square, Seattle's birthplace, before plunging underground for a time-capsule view of the buried city! Our tour guide, Julie was amazing, and regaled us with sidesplitting stories of Seattle's pioneers ~ Dirt; Corruption; Sewers; Scandal!!! Hmmm, sounds like history in the making!!! It was amazing to learn about how Seattle was originally founded and established, and how the great fire was started, and how the town decided to improve on the 'old' Seattle, and build it higher up, and not in the floodplain, so as not to have the same 'sewer' problems they'd had for years before - since the invention of the toilet by Mr Crapper!!! Take a look at some of the photos of the 1800's in Seattle! So, after a lovely day exploring the tastes and smells of both current day Seattle, and of days gone by, I headed back to the Mediterranean Inn, checked out, ordered my taxi, and arrived at the Best Western Executive Inn, checked into my room, found out where the Spa was, headed to my room, changed into my costume, and headed straight to the Jacuzzi to soak my aching legs and feet... aaaahhhhhh, bliss!!! I must have been in there for about an hour, cos by the time I got back to my room it was night time, and I drew back the curtains to see an awesome view of the Space Needle all lit up!! !